Quitclaim deeds transfer a grantor's (owner) interest in real estate, if any, to a grantee (buyer). The deeds do not include any warranties of title, so they offer no protection to the grantee. They are, in effect, "as-is" deeds. Because quitclaim deeds lack warranties, their most common uses are for transfers between spouses/family members, in divorces, and to clear simple title issues. A quitclaim deed submitted for recording in Wyoming must identify the grantor and grantee by name. In order to be considered properly executed, the following information should be included: the grantor's name and mailing address, the consideration paid for the real property, the words "conveys and quitclaims," the grantee's name and mailing address, a legal description of the real estate, the county the real estate is situated in, and the date of execution. If there is more than one grantor or grantee, each grantor and grantee's name and address must be provided. An original signature is needed for each grantor listed in the quitclaim deed. (Wyo. Stat. 34-2-104, 2012). The grantor's signature must be acknowledged by a notarial officer and should be in compliance with the requirements of Wyoming Statutes 34-26-107. A county recorder may refuse to record a Wyoming quitclaim deed if a fully completed and sworn Statement of Consideration is not included. If an exemption applies, the Statement of Consideration is not required by law, but submitting the statement for an exempt transaction may alleviate the need for the county assessor to contact the buyer to confirm an exemption. 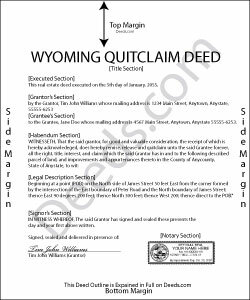 Once a quitclaim deed is recorded according to the provisions of the Wyoming Annotated Statutes, it serves as notice to subsequent purchasers (Wyo. Stat. 34-1-121) that an interest in real property has been publicly declared. The first recorded quitclaim deed will have priority over later recordings involving the same real estate. An unrecorded quitclaim deed is void against later good faith buyers paying valuable consideration for the same real estate whose conveyance is first recorded (Wyo. Stat. 34-1-120, 2012).